Brightly colored blue and white technological elements that look like they're part of a Heads Up Display design. Nice science fiction style. This video loop would work perfectly on your big screens, a beautiful asset for your video collections. 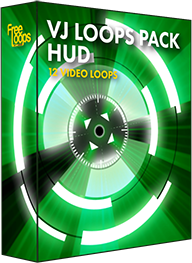 This video loop is part of VJ Loops Pack HUD.